Corrects article from July 20 regarding products sold by Armstrong World. Armstrong World (AWI - Get Report) , Lennox International (LII - Get Report) , Masco (MAS - Get Report) , Owens Corning (OC - Get Report) and Vulcan Materials (VMC - Get Report) provide products and materials to all segments of the housing market including new home construction, home resales and home improvement. Homebuilder stocks continue to struggle well below their bubble peaks set in July 2005, while these housing-related stocks have seen late-cycle strength. Four of the five set all-time highs in July with Lennox and Owens Corning setting their highs on Tuesday. Armstrong World provides ceilings and cabinets. Lennox provides air conditioning and heating systems. Masco provides home improvement and building products. Owens Corning makes insulation, roofing and siding products. Vulcan Materials makes the ingredients for concrete and cement. Lennox reported results on Monday and beat analysts' estimates. The stock traded to an all-time high of $151.45 on Tuesday closing in on my key level of $154.38 in play until the end of the year. Masco is scheduled to report earnings on July 26 and the stock set its all-time high of $34.24 on July 14, slightly exceeding my key level of $33.82, which should be a magnet for the remainder of the year. Owens Corning is scheduled to report earnings on July 26 and the stock set its all-time high of $55.34 on Tuesday, but closed below the Monday low of $54.79, which is a potential daily "key reversal" confirmed by lower closes today and Thursday. The high was just shy of $56.48, which is a key level until the end of 2016. Armstrong World is scheduled to report earnings on July 29. This stock is a laggard and is in bear market territory 27.5% below its all-time high of $53.63 set on Feb. 14, 2014. Vulcan Materials is scheduled to report earnings on Aug. 1 and the stock set its all-time high of $127.17 on July 11. This week's key level is $123.14. The housing index is positive with the index above is key weekly moving average of 239.25 and above its 200-week simple moving average of 205.26. Weekly momentum is projected to rise to 78.77 this week up from 70.49 on July 15. 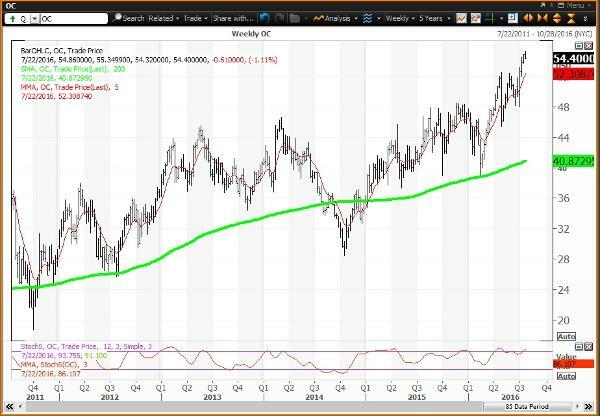 The weekly chart for Armstrong World is neutral with the stock below its key weekly moving average of $39.40 and well below its 200-week simple moving average of $44.84. The weekly momentum reading is projected to uptick to 39.43 this week up from 39.20 on July 15. 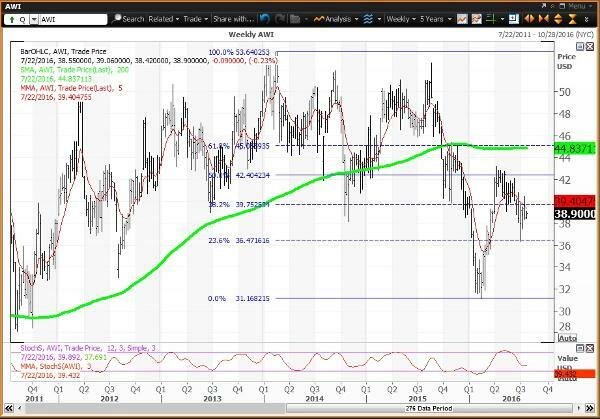 The horizontal lines are the Fibonacci retracement levels of the decline from the Feb. 14, 2014 high of $53.63 to the Feb. 11, 2016 low of $31.13. 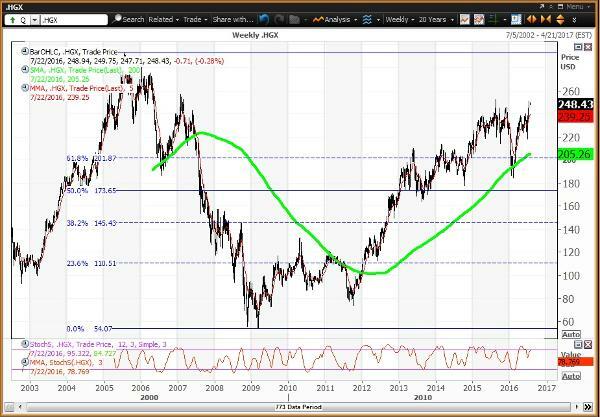 The stock is between its 23.6% retracement of $36.47 and its 50% retracement of $39.75. Investors looking to buy Armstrong should buy weakness to $36.90 and $35.60, which are key levels on technical charts until the end of September, and until the end of July, respectively. Investors looking to reduce holdings should sell strength to $41.95 and $44.84, which are key levels on technical charts until the end of 2016. The weekly chart for Lennox is positive but overbought with the stock above its key weekly moving average of $143.45 and well above its 200-week simple moving average of $93.72. The weekly momentum reading is projected to rise to 84.33 this week up from 78.26 on July 15, moving above the overbought threshold of 80.00. Investors looking to buy Lennox should buy weakness to $143.75 and $134.42, which are key levels on technical charts until the end of September and the end of July, respectively. Investors looking to reduce holdings should sell strength to $154.38, which is a key level on technical charts until the end of 2016. 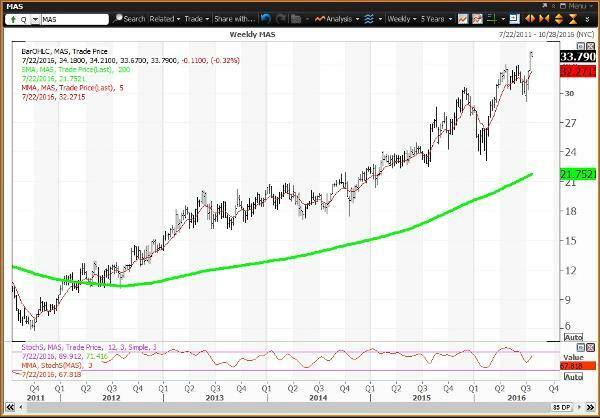 The weekly chart for Masco is positive with the stock above its key weekly moving average of $32.27 and well above its 200-week simple moving average of $21.75. 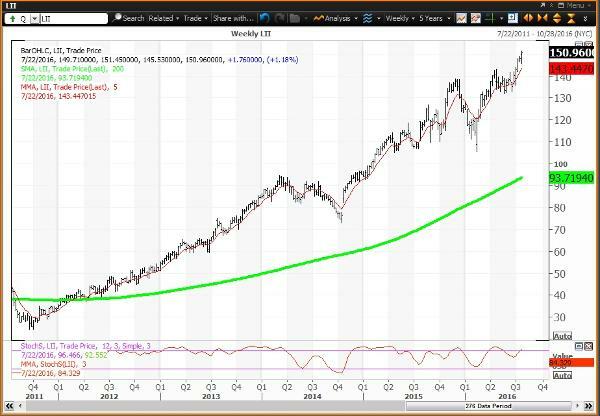 The weekly momentum reading is projected to rise to 67.82 this week up from 56.77 on July 15. Investors looking to buy Masco should buy weakness to $30.88, which is a key level on technical charts until the end of July. Investors looking to reduce holdings should sell strength with the stock above key levels of $33.13 and $33.82, which are key levels on technical charts until the end of September and the end of 2016, respectively. 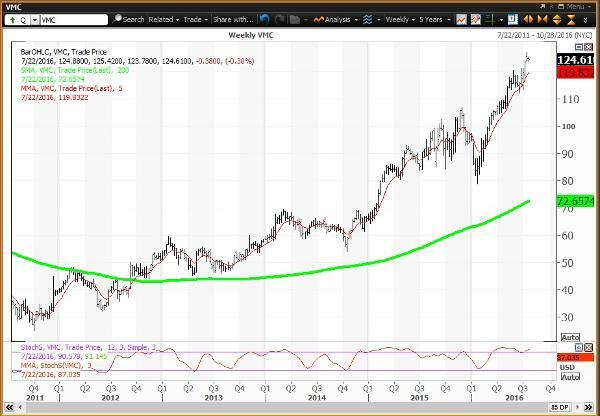 The weekly chart for Owens Corning is positive but overbought with the stock above its key weekly moving average of $52.31 and well above its 200-week simple moving average of $40.87. The weekly momentum reading is projected to rise to 86.11 this week up from 82.28, becoming more overbought above the threshold of 80.00. Investors looking to buy Owens Corning should buy weakness to $50.12 and $48.76, which are key levels on technical charts until the end of July and the end of 2016, respectively. The weekly chart for Vulcan Materials is positive but overbought with the stock above its key weekly moving average of $119.83 and is well above its 200-week simple moving average of $72.66. The weekly momentum reading is projected to rise to 87.04 this week up from 85.26 on July 15, becoming more overbought above the 80.00 threshold. Investors looking to buy Vulcan Materials should buy weakness to $119.51 and $117.84, which are key levels on technical charts until the end of September and the end of 2016, respectively. Investors looking to reduce holdings should sell strength to $126.57, which is a key level on technical charts until the end of next week.